I spent most of my childhood wondering why black people didn’t fight more. Why hadn’t black women poisoned the families of slave owners if they cooked all the food? Why, if black people outnumbered white people on plantations, hadn’t they just killed everyone? Slave revolts were entirely unknown to me until adulthood. I had heard about Nat Turner, but I never really learned about who he was or what he did. And even with all of my curiosity and time in the library, I never looked for him because I didn’t have any clue what I might find. When I did learn though, Nat Turner became a hero. Vesey, a role model. When I read Book of the Night Women by Marlon James, I was ecstatic at the vengeance he gave the enslaved people. The book was so vivid in my mind that I wondered if there would ever be a film. The thought was quickly pushed out of my mind because it was ridiculous. A Jewish revenge fantasy about Nazi’s was perfectly reasonable. A black revenge fantasy about slaveholders would never happen. Inglourious Basterds was expected. Django Unchained was a birthday and Christmas gift. Jamie Foxx looked utterly coonish in that blue velvet getup but when he took that whip to an overseer, I almost jumped out of my seat with glee. My wife describes my reaction to watching Chris Washington stomping Jeremy Armitage in Get Out as “scaring the white people” sitting next to me. I was genuinely joyful at the end of those movies. It turns out revenge fantasy is healthy. It’s a perfectly reasonable way to deal with anger. It can even bring you joy. It allows us to blow off steam and move on from injustices. But what if those injustices don’t let up? As I watched Killmonger’s character lay out his plans, I was frightened. Of myself. Killmonger’s perspective on the history of black life in America and in the diaspora is no different from mine or that of many of the black people I know. His rage is justifiable. Its foundation is a deeply personal wound, but its construction is the solid reality of black people everywhere. His rage was echoed in the theaters. When the museum administrator declares that the artifacts are not for sale, and Erik asks whether her ancestors paid a fair price, the crowd almost as a single voice, affirmed him. But when the woman and her colleagues died, I didn’t hear anyone grieve for them. When Killmonger describes how things would have been different if black people around the world had had better weapons for their uprisings, the audience rumbled with agreement. As I reconsider the questions I had as a child well into early adulthood, I am in awe of my ancestors. Although there were those who rebelled, black Americans have been patient and gracious to a degree entirely unearned by white America. The distance among Dr. Martin Luther King Jr., Malcolm X, and dare I say, the Black Panther Party for Self Defense is, upon reflection, not that great. The distance between nonviolence and self-defense is miniscule when compared to the distance between both those approaches and terror. The idea that those two men could be considered threats to the United States is laughable unless one equates the interests of the United States with the interests of white economic and political power. Even then, neither of these men sought to lead the nation’s black people in armed rebellion. I don’t think any race of people is superior to another. At same time, I am curious about what makes up black Americans that we are so resilient while white frustrations with the idea of equity lead to violent reactions. Are white people more susceptible to fear? Are they less resilient? Are they overly sensitive? Today in the U.S. black Americans have virtually unlimited access to weapons. In places where we are a majority or even a substantial minority, we would wreak havoc. So why haven’t we? The obvious answer–for those who think that was a real question–is that unlike white militias we are not delusional. Black people have a collective capacity for understanding the overwhelming power of the United States and its ability to destroy black communities. That destruction has been a reality from the beginning. The odds are never in our favor. I haven’t struck another person since I was 13. I’ve heard people say that it doesn’t feel good or right to engage in acts of violence. As someone who has engaged in my fair share of fights, I have to disagree. There is something quite gratifying about teaching the undeniable lesson that I am not going to be anyone’s victim. Knowing that others acknowledge your physical power is deeply gratifying. Isn’t that part of what it means to be American? Don’t we teach our children to be proud of our military might? The might that we have to kill countless people and destroy entire cities is our badge of honor. Killmonger’s imperialist urge may have been a bit on the nose–“The sun will never set on Wakanda.”–but what was once European is now core to the identity of the United States in the world. I am endlessly amazed that it is possible to be black and American and not consider violence as the surest pathway to freedom. Surely everyone one of us has considered it necessary at some point in our development? 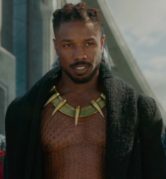 I don’t know about everyone else, but I know that my overall reaction to Killmonger shook me. I was horrified to see the potential of my anger no matter its justification. It disturbed me to my core that white people I love and their beautiful children could become enemy targets. White people who see me, care for me, and have championed me at various points in my life should never be on the receiving end of any kind of vengeance. Revenge fantasy is discrete and imaginary. Terror has no bounds. I am a long way from revolutionary love, but I am beginning to see why nonviolence may be the right approach. As much as I might find joy in revenge fantasy, I doubt there is joy to be found in actual revenge. When Killmonger asserts that he has learned from his oppressor and T’Challa yells back, “You have become them!”, I felt it in my gut. I don’t want to become the thing that has caused us so much pain, loss, and poverty. At the same time, I want us to make our justifiable rage known and stand in opposition to perpetual injustices. I understand how justifiable rage can be at the roots of terrorism. I see how retribution for horrible wrongs can lead to acts of violence. I also know that killing every wrongdoer–if it were even possible–doesn’t get us to the change we seek. It only diminishes our humanity. I have begun to amass knowledge about working across divides. I’ve been learning about identifying and managing conflicting mental models. I’ve watched the revolutionary love Ted Talk numerous times. I’ve gone from scoffing at Valarie Kaur to considering her story and those she shares. I’ve poked around the edges of Kingian nonviolence and seek to embrace the idea of attacking the forces of evil not the people doing evil. The road to our freedom as black people in the United States is paved with the bodies of our leaders. That fact is at the heart of my struggle. Why do we have to carry the weight of our oppression and our freedom? I may never get an answer to that why. I have to become comfortable in not knowing. I also have to find a way to pursue justice that puts some of the weight on the perpetuators of injustice while maintaining my integrity and preserving my humanity. I don’t have to know why to demand that things be different. And I don’t have to become what I despise.